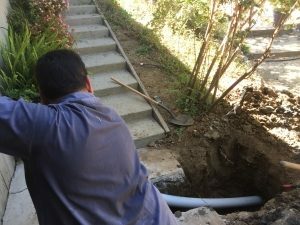 Trenchless Sewer And Water Replacements In San Jose | Cupertino Plumbing, Inc.
Water and sewer lines play an important role in commercial and residential plumbing, supplying incoming water and carrying away wastewater generated by plumbing fixtures. In the past, problems with underground sewer or water lines required days of extensive digging and replacement to solve the problem. Today, our plumbers can perform trenchless sewer and water line replacements to quickly and easily repair damaged lines without the need for unsightly trenches or days without water. At Cupertino Plumbing, we are pleased to offer trenchless pipe repair technology in addition to water heater installation, bathroom remodeling, toilet repair, and re-piping in San Jose. One of our plumbers will identify the problematic pipe and make one or two holes on your property, typically at either end of the pipe. These holes are only one to two feet in diameter, minimizing any damage to your landscaping. Your pipe is repaired or replaced via these small holes. Cracked pipes are repaired from the inside using a coating that creates a new lining to seal any leaks. Pipes that require replacement are broken up with a bursting head, which destroys the old pipe and pushes the pieces into the surrounding soil as it is pulled through the pipe with a cable. The cable pulls a new pipe into place behind the bursting head during this process. Once your pipe has been installed or replaced, our expert plumber will inspect the work and fill in any holes that have been made to finish the repair process. When tree roots penetrate your sewer line looking for water, they can cause cracks and clogs that affect the pipe’s integrity and function. Over time, increased pressure from above can cause your sewer line to collapse, completely disrupting wastewater drainage from your home until the pipe is replaced. Severe or frequent clogs can cause pressure buildups in your sewer line, which may lead to a burst pipe.